Submitted by a member of the Glassmen. 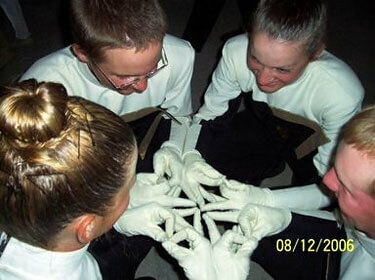 This is a picture of a group of Glassmen horn line members that became known as the "quadforce." We all figured out how to make the "Glassmen Shield" with our hands and put them together for a little pre-show prep. We did this before every performance and this is a picture of us before our DCI World Championship Finals show in Madison, Wis.
From bottom left (clockwise): Sara Link (mellophone), Cory Edgar (mellophone), Kyleigh Rupp (mellophone) and John Yeager (baritone). For all of us, this was our rookie year at Glassmen, except for Sara, who has been with the Glassmen since 2004.